Sturgeon, male common seal pup, was rescued on 14th September 2017 from Southwold in Suffolk. Sturgeon was rescued after he was reported by a member of the public with some wounds to his rear body and flippers. 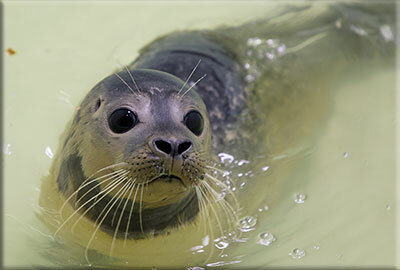 The Animal Care Team suspects that this pup had a fight with an adult seal. 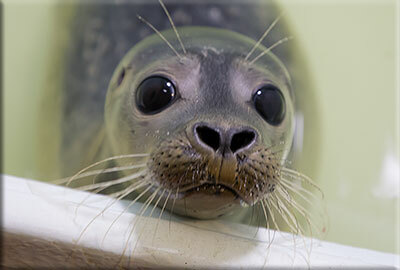 He was checked in the hospital and the vet noticed Sturgeon had an infection to the top of his mouth. He was put on lots of medication to make him better so he can be returned to the Wash.
Update - 13th November 2017 : These photos left and above of Sturgeon were taken on 11th November 2017 in the hospital´s pen. His flipper tag number 473 (white). Update - 16th December 2017 : Sturgeon was released back to the wild on 11th December 2017.